There are so many restaurants that offer steamboat in Penang. But if you are looking for something light without msg, just enough for 4 to 5 persons, I would recommend Maple Palace Fish Steamboat. When the steamboat is served, almost half of the dishes have already been pre-cooked in the steamboat. The waiter will help to add in the rest. You can see the prawns are fresh and big. Other dishes also in good quality. Besides the common soya sauce with chili, they also provide 2 other types of dipping sauce, which are the sambal shrimp paste and special sauce. The special sauce taste a bit sour that is mixed with red onion, spring onion and ginger. Beside fish steamboat, every Tuesday and Thursday you get to order Traditional Crispy Peking Duck, they will serve the skin first, then you have to decide what to do with the meat. 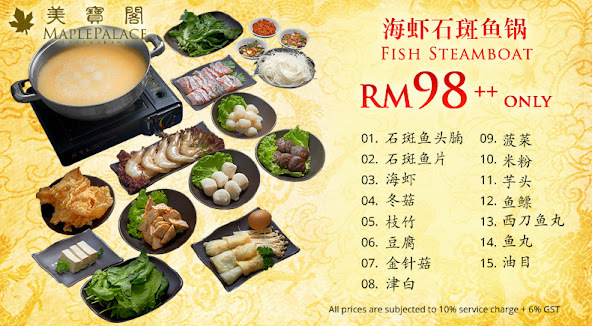 For the skin and meat dish cost only RM68++（after tax around RM79.30）. The duck skin is crispy and delicious, but Gibson did not really like the texture of the wrapper. We decided that the duck meat be cook with noodles. The waiter serves each of us a bowl of noodles. They also serve tidbits, besides the common peanuts, sometime they serve fish skin, which is crispy and nice. But each small plate of tidbit cost RM2. The wet tissue in this golden packaging cost RM0.60. Gibson likes the dessert here. Boiled glutinous dumpling in almond tea is one of his favorite. Each cost RM10. If you do not like almond, the same dessert can come in ginger tea. Gibson likes the service here. During lunch hour, all the waiters are local and are professionally trained; even your bags and belongings can be placed in a special rack provided. Address: 47, Jalan Sultan Ahmad Shah, 10050 Penang, Malaysia. The price list presented here is as on 4th August, the day when I visited the restaurant, they do charge 6% GST and 10% service charge.